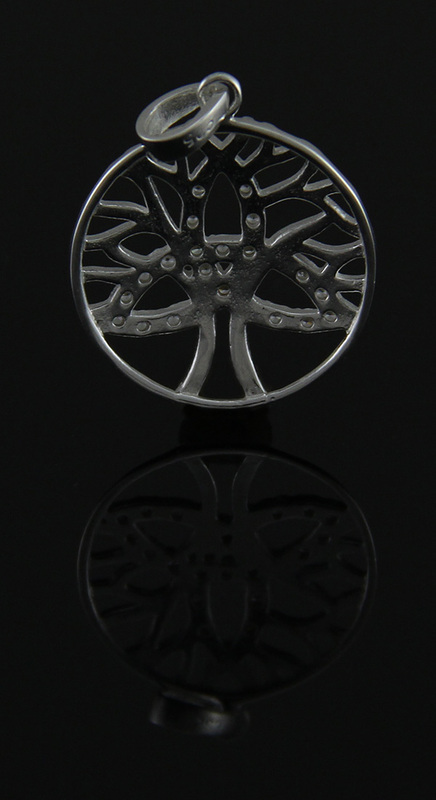 Combining the Celtic triquetra trinity knot symbol and the Tree of Life, this brilliant sterling silver pendant brings you the power of the three to draw on and bring unity into your life from all realms of existence. The Tree of Life is rich in cultural heritage and symbolism, and exists in all three planes of being with branches ascending into the heavens, its trunk hugging the earth and its roots reaching deep into the underworld; interconnecting all realms. The pendant measures .75 inches in diameter with a bail that accommodates chains up to 4mm. The finish is polished, with a texturized triquetra, so it catches the eye quite nicely, and is stamped .925 on the reverse. It's a brilliant gift for those into Nature religions.